The Comfort Inn Vauxhall Hotel is one of the best budget hotels and, at the same time, ideally located just South of River Thames, in a beautiful area, very close to the center of London. It is enough to say that the Vauxhall Bridge is just minutes away from the hotel, at a walking distance, therefore the famous view of London, with the London Eye and the Houses of Parliament and Big Ben is available to every guest that wishes to explore the city wonders. In case you are concerned about the accessibility by public transport, we inform you that the hotel can serve your needs, as it is very close to the Waterloo International Station and Victoria Station, from where you can make a direct connection to Gatwick Airport. Also, the numerous touristic attractions and the vibrant life from the surrounding area will certainly make your holiday unforgettable. Except for the London Eye and The Houses of Parliament, already mentioned, you can take a small walk to Tate Britain Gallery, Westminster and Trafalgar Square. In the evening, if you decide to go out, you can choose from the numerous theatres, restaurants, pubs and wine bars. The three star hotel facilities include a business center, a continental breakfast, parking, Wi-Fi that may require additional costs and many others. In order to get rail transport from London Heathrow Airport to Comfort Inn Vauxhall Hotel, you need to take the tube from the Heathrow Airport Station to Green Park Underground Station, using the Piccadilly Line. The train comes every 5 minutes and the journey takes about 45 minutes. From there, you will have to change to Victoria line and take the tube to Vauxhall. The last station is minutes away from the hotel. 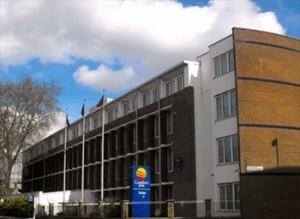 London Heathrow Airport is 19 miles away from Comfort Inn Vauxhall Hotel. If you want to travel by car, you have to take the M4 road after you exit the airport area, then to continue the A4 Road until Earls Court. You will then have to follow the A3220 and the Thames Shore until you reach Vauxhall Bridge. The hotel is located a few meters away from Vauxhall Park, on S Lambeth Road. 247 Heathrow Airport Transfer can always provide you with a taxi to Comfort Inn Vauxhall Hotel. The price for a Saloon car is £39 and the journey can take up to one hour and 53 minutes if we include any traffic delays that may occur in rush hour time.